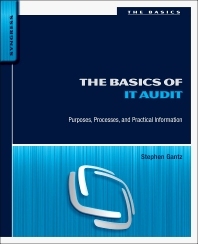 The Basics of IT Audit: Purposes, Processes, and Practical Information provides you with a thorough, yet concise overview of IT auditing. Packed with specific examples, this book gives insight into the auditing process and explains regulations and standards such as the ISO-27000, series program, CoBIT, ITIL, Sarbanes-Oxley, and HIPPA. IT auditing occurs in some form in virtually every organization, private or public, large or small. The large number and wide variety of laws, regulations, policies, and industry standards that call for IT auditing make it hard for organizations to consistently and effectively prepare for, conduct, and respond to the results of audits, or to comply with audit requirements. This guide provides you with all the necessary information if you're preparing for an IT audit, participating in an IT audit or responding to an IT audit. IT Security Professionals (Security Auditors, Security Engineers, Compliance Specialists, etc. ), IT Professionals (Network Administrators, IT Managers, Security Managers, Security Analysts, Directors of Security, etc. Stephen Gantz (CISSP-ISSAP, CEH, CGEIT, CRISC, CIPP/G, C|CISO) is an information security and IT consultant with over 20 years of experience in security and privacy management, enterprise architecture, systems development and integration, and strategic planning. He currently holds an executive position with a health information technology services firm primarily serving federal and state government customers. He is also an Associate Professor of Information Assurance in the Graduate School at University of Maryland University College. He maintains a security-focused website and blog at http://www.securityarchitecture.com. Steve’s security and privacy expertise spans program management, security architecture, policy development and enforcement, risk assessment, and regulatory compliance with major legislation such as FISMA, HIPAA, and the Privacy Act. His industry experience includes health, financial services, higher education, consumer products, and manufacturing, but since 2000 his work has focused on security and other information resources management functions in federal government agencies. His prior work history includes completing projects for government clients including the Departments of Defense, Labor, and Health and Human Services, Office of Management and Budget, Federal Deposit Insurance Corporation, U.S. Postal Service, and U.S. Senate. Steve holds a master’s degree in public policy from the Kennedy School of Government at Harvard University, and also earned his bachelor’s degree from Harvard. He is nearing completion of the Doctor of Management program at UMUC, where his dissertation focuses on trust and distrust in networks and inter-organizational relationships. Steve currently resides in Arlington, Virginia with his wife Reneé and children Henry, Claire, and Gillian. CISSP-ISSAP, CEH, CGEIT, CRISC, CIPP/G, Founder and Principal Architect of SecurityArchitecture.com. A basic title for non-security IT Professionals, essentials topics for training and IT Security awareness. A must read for everyone in IT departments.